Apparently celebrity farmers are the Next Big Thing. And while a humble Sonoma County vegetable grower probably isn’t going to achieve the cult status of say, Joel Salatin (who was popularized in The Omnivore’s dilemma), Leonardo Urena was a Rock Star (captial R, capital S) at the Harvest Fair yesterday. About a dozen people surrounded him as he told the tale of his 1110 pound pumpkin which took first place in the annual pumpkin weigh-off. He grew it organically, kept it shaded and watered, and even cut chunk out of it to prevent mold from spreading and destroying his prized pumpkin. Watching him answer questions made me realize that for every celebrity farmer, there are hundreds- if not thousands- of others who will live their lives in relative obscurity, and it makes me glad there are competitions like this at state and county fairs because it gives these quiet people a chance to shine before they come back down to the earth to which they’re so connected. 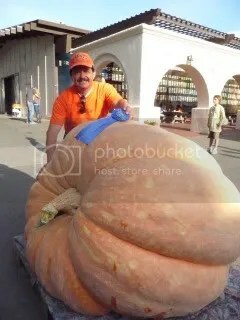 This entry was posted in American regional, Gardening and tagged giant pumpkins, harvest fair, sonoma county. Bookmark the permalink.